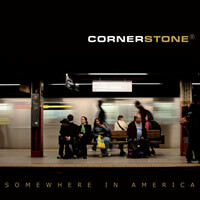 In my world CORNERSTONE are a middle-of-the-road band. The song material often has a stable beat, but the killer refrains and true spark seems to be missing. The main highlights are few, I´d chose the classic AOR of “Like a Stranger”, the distantly possible hit “Right or Wrong” or the storytelling of “Strut”. But the rather lackluster pop of the majority of the material takes more charisma and identity to break the band big time. I wish for more variation and some more tracks (with stronger refrains) in the vein of “High and Low”. I don´t think Santa will deliver too many of these in gift wrapping.